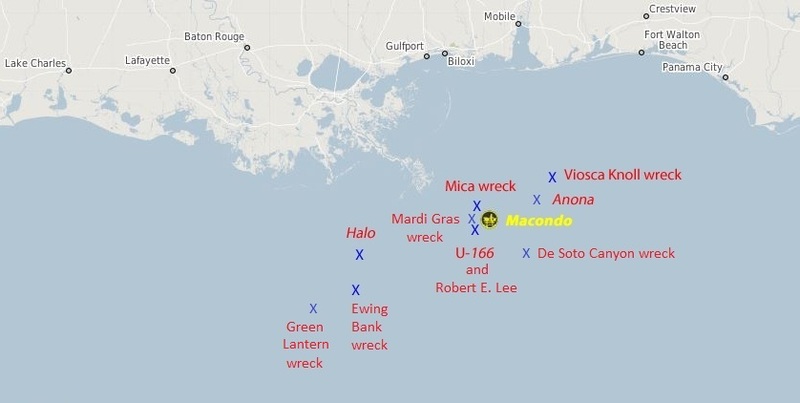 Up to ten shipwrecks will be investigated as part of this study: five wooden-hulled sailing ships dating to the 19th century (Ewing Bank wreck‎, Viosca Knoll wreck, Mica wreck, Green Lantern wreck, and Mardi Gras wreck), one wooden-hulled sailing ship pre-dating the 19thcentury (De Soto Canyon wreck), and four World War II-era steel-hulled vessels (Halo, Anona, U-166, Robert E. Lee). Most of these sites were discovered and examined prior to the oil spill by archaeologists, though only a few have been visited since the 2010 spill. Potential impacts to archaeological resources are not considered by the Natural Resource Damage Assessment process and no other studies are investigating impacts to shipwrecks and other submerged cultural resources from the spill.